5.2 Comic: "We're done, right?" 5.4 Comic: "What did I do wrong?" 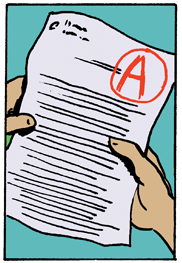 5.6 Comic: "And we do it all over again"
Learning outcome: Know how you can develop as a proficient academic writer. Review what you've learned in this resource about writing at university. Learn how University of Auckland students and staff have become better writers.